Frankfurt (technically Frankfurt am Main) is the largest city in the German state of Hesse and the fifth-largest city in Germany. Evidence of a Jewish community in Frankfurt can be traced back to the 12th century. Evidence of a Jewish community in Frankfurt, a city on the Main river in western Germany, dates back to the 12th century. At that time, a small group of Jewish merchants from Worms settled in the town, and quickly flourished and grew wealthy. Jews had been in Frankfurt prior to this period as well, but never as official residents  Frankfurt had long been a market town, and Jews visited to trade there as early as the tenth century. The prosperity of the Frankfurt Jews, however, was short lived. The year 1241 marked the first of what would be many massacres and expulsions of the small community. In this first attack, which was sparked by the refusal of a Jew to convert to Christianity, more than three-quarters of the city's 200 residents were killed. The remainder quickly fled the city, but returned by about 1270, when Emperor Frederick II, upset at the loss in tax-revenue from the wealthy Jewish community, ordered strict penalties against anyone who attacked Jews. The community once again grew rapidly, and although forced to pay crippling taxes, was protected against any physical persecution. The outbreak of the Black Plague in 1349, however, changed the Jews' protected status. Jews were killed and expelled throughout Germany and Europe, and Frankfurt was no exception. The community was completely massacred, and many Jews chose to burn down their own houses while still inside rather than face death from the angry mob. Because of their important economic role, Jews were invited back into Frankfurt once again in 1360. Their lives in the city however, were regulated more strictly than ever, culminating in the forcible relocation of all the Jews of Frankfurt to a ghetto (Juddengasse) in 1462. Originally containing just 110 inhabitants, the community developed quickly, and consisted of 3,000 by 1610. Because the area of the ghetto was never expanded, Jews subdivided their houses and built extra stories to accommodate the exponential growth. The community soon became a center of Ashkenazi Jewry  the yeshivas in the city attracted students from all over Europe, and the community grew very wealthy. In 1616, another pogrom came through the community. Indeed, affluence was a necessity, for the only way the Jewish community continued to exist in the fifteenth through seventeenth centuries was by paying enormous tributes in exchange for protection. In 1624, the two centuries of peace came to a crashing halt as the ghetto was raided and plundered by a mob of artisans and petty merchants, led by Vincent Fettmilch. The group was unhappy with the prominent position of the Jews, and many also owed money to the Jewish moneylenders. Unlike the previous expulsions, however, this one ended happily for the Jewish residents of Frankfurt. The emperor outlawed the rioters, put their leaders to death, and ceremoniously returned the Jew to the ghetto on the twentieth day of the month of Adar, which has been celebrated in Frankfurt ever since as "Purim Winz" ("the Purim of Vincent"). In 1711, the ghetto burned to the ground after an accidental fire spread out of control, but the homes and businesses were quickly rebuilt, and the Jews returned to their isolation. The traditional unity of the Jewish population, however, soon began to decline, as controversy over the Enlightenment and the conflict between Rabbi Jacob Emden and Rabbi Jonathan Eybeschuetz spread throughout Europe. The rich families that had long controlled the community saw their influence begin to decline; these families, identifiable by the crests hanging outside their homes, lost their influence to the maskilim, who advocated secular education and emancipation. The only exception was the Red Shield, or Rothschild family, which maintained its importance, and became even more prominent in later years. When, in 1806, Frankfurt was incorporated into Napoleon's Confederation of the Rhine, the Jews' lot improved, at least in the eyes of the advocates of emancipation. The spread of the ideals of the French Revolution led to the abolition of the ghetto in 1811. Despite setbacks in 1819 due to the "Hep Hep riots," Jews received rights equal to those of non-Jews in1824. Frankfurt had by now become a center of the Reform movement, the ascendance of which led to a widening rift between the Orthodox and Reform communities. The latter was led during much of the nineteenth century by philosopher Abraham Geiger; the former, which accounted for only ten percent of Frankfurt's Jewish population in 1842, was revived by Rabbi Samson Raphael Hirsch, who founded the Orthodox "Israelitische Religionsgesellschaft" ("Israelite Church Society") in 1851. The community continued to grow and become wealthy; members of the Rothschild family in particular became known for their philanthropy. 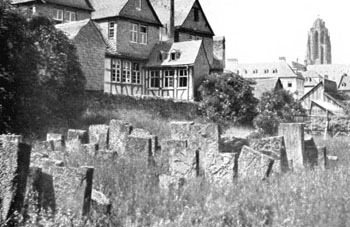 Several orthodox yeshivas were established, as was a Reform Institute for Jewish Studies, which featured lectures by the scholar Martin Buber. By the 1900s, Jews in Frankfurt were extremely prosperous and influential. They became active both in business and politics. Many of the Jews fought for Germany in World War I. In 1933, a boycott was targeted at the Jews, and in the subsequent years, more and more restrictions were placed on the Jewish community. On November 10, 1938, the biggest Orthodox and Reform synagogues were burned to the ground. Many Jews emigrated from Frankfurt, and most of those who did not were sent to the Lodz ghetto, and eventually to the Dachau and Buchenwald concentration camps. In 1933, 30,000 Jews lived in Frankfurt; in 1945, only 602 remained. After the war, a new community was established, consisting of Holocaust survivors and displaced persons. In 1989, immigrants from the recently disbanded Soviet Union increased the size of the community to about 7,000. Today, most of the Jews live in the West End, and are self-employed, particularly as shop-keepers and real-estate brokers. Anti-Semitism is negligible; instead, assimilation is the community's dominant social problem. All the city's synagogues, only one of which dates to before 1938, are Orthodox. There are few remnants of Frankfurt's Jewish community left today. The ghetto has been gone for more than a century, but the spot on which it stood is still accessible. Not far from the Zeil  the pedestrian mall running through the city's center  on Bornestrasse, is the stretch of land on which the Frankfurt Jews lived for more than 400 years. The Bornestrasse synagogue and the Rothschild home were both destroyed, but plaques mark the spots where they stood. 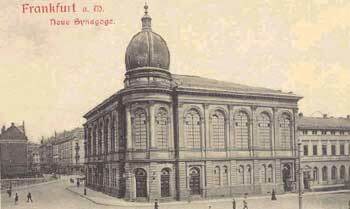 The Westend synagogue, on Freiherr-vom-Stein-Strasse, is the only Jewish building in the city with a history. The large grey building was built early in the 1900s, and was the only synagogue to survive Kristallnacht. Near the synagogue is Frankfurt's Jewish community center, a huge building adorned with large iron menorahs and stone tablets. The building features concerts, lectures and information on all things Jewish in Frankfurt. The Jewish museum on Untermainkai is located in a house that once belonged to the Rothschild family, and features high-tech resources as well as priceless artifacts, including Moritz Oppenheimer's famous portrait of Mendelsohn and Lessing. But the most famous part of the museum is the scale-model of the Frankfurt Juddengasse, reconstructed using the blueprints made in 1711 after it was destroyed by fire. The intricate model includes 194 buildings. Mendes-Flohr, Paul, and Judah Reinharz. The Jew in the Modern World: A Documentary History. Oxford University Press. New York, 1995. Tigay, Alan. The Jewish Traveler. Jason Aronson, Inc. Northvale, NJ, 1994.